When the hot Arizona summer sun starts beating down on your roof, you know it’s in your best interest to minimize the amount of heat that starts building up inside your home. We know it too, which is why when you contact Precision Air and Heating to help keep you cool in the summer, we can do more than just service your AC. We can also help prevent your attic from becoming super-heated—with the help of the best radiant barrier Phoenix has to offer. When the hot sun beats down on your roof, your shingles can reach temperatures of 150 degrees F or higher. That heat needs to go somewhere, and without a barrier between that heat and your attic, it’s going to slowly transfer itself into the plywood. From there, the heat is going to search out the cooler spots in your attic. That includes the walls, the floor, your stored boxes, and even your insulation. Attic fans, vents, and even air conditioners are just a Band-Aid, because they can only cool and move the air. In an overheated attic, however, it’s not the air that’s the problem. It’s the physical surfaces that have had their heat transferred directly from the roof. Moving the air around with an attic fan might help, but it isn’t going to address the real issue. We recommend a solar reflective coating like LO/MIT, which is the best radiant barrier Arizona companies like Precision Air & Heating can provide. 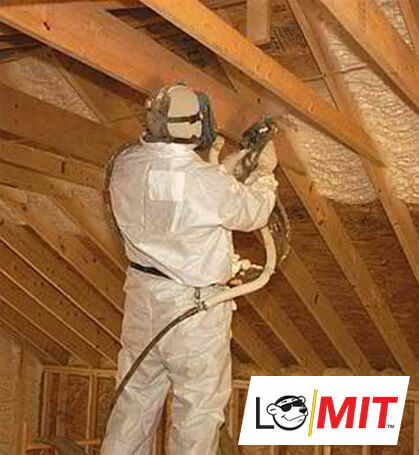 LO/MIT is a spray-on coating that we apply to the underside of your roof-line. When the sun hits your shingles and heats them up, the heat will naturally try to transfer down into your attic. Once it hits that coating, it is effectively blocked because the coating reflects the heat rather than absorbing it. This lack of heat transfer can lower your attic temperatures by as much as 40 degrees. Without that super-heated attic above you, your home will be cooler, and you’ll be spending far less on your energy bills. The solar reflective coatings we use have been Energy Star certified, and are proven to reduce the transfer of heat to your attic by more than 80%. The key is to leave a gap between the coating and the rest of your attic so that any heat the coating absorbs doesn’t infiltrate. Let our trained technicians show you how easy it is to reduce your attic’s temperature and save money. Some roofing manufacturers may tell you that your shingles need to transfer the heat from the summer sun into your home to extend the shingles’ lifespan. This isn’t true. The Florida Solar Energy Center has conducted tests that show the difference in wear between shingles that are heating your attic and shingles that have a radiant barrier beneath them. The difference is negligible. There is absolutely no risk to applying a radiant barrier to the underside of your roof deck. When you think about everything you can gain—cooler air temperatures in your attic, lower cooling bills in the summer, less energy usage—it just makes sense to have a radiant barrier installed. At Precision Air, we’re interested in helping you keep comfortable during the hot Arizona summers. We’ll help you figure out the best means to ensure that you stay comfortable, without racking up huge energy bills in the process. Give us a call today to set up an appointment. Our service areas include: Phoenix, Mesa, Scottsdale, Tempe, Chandler, Glendale, Gilbert, and Peoria. We’ll show you how easy it is to start cooling your attic and home with just one application of a radiant barrier to the underside of your roof deck.